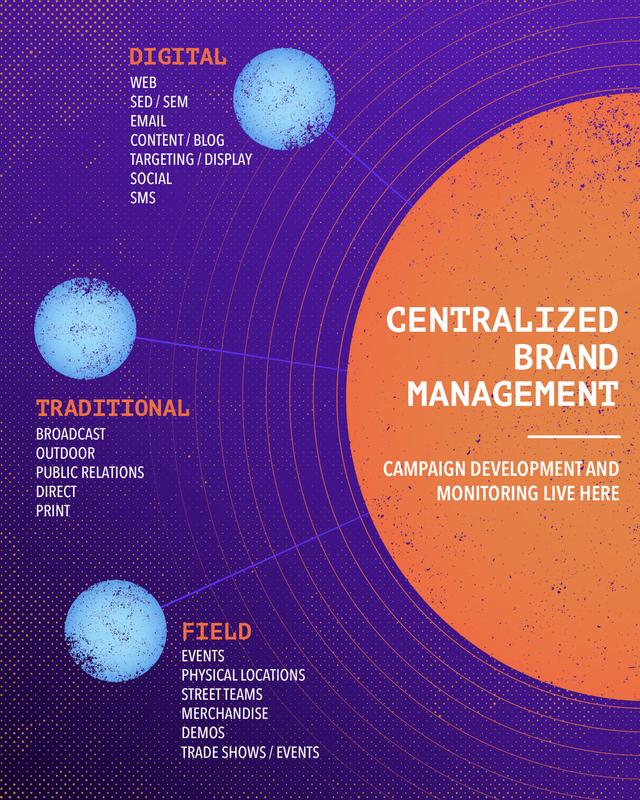 Thinking > CATEGORY > Orange Element Thinking > Centralize your brand…connect your dots. Large companies typically have several employees in their marketing departments. The larger the company, the more a team’s clear path to successfully reaching customers can be compromised. Segmentation of channels, tasks, and approval processes can create obstacles that hinder developing a strong strategy and body of work. It’s not to suggest that great things aren’t happening within these companies. How greatly can your campaigns engage with customers and motivate them to take action? What are you missing, in strategy or campaign, that you can’t even see? Do you have the right people adding the right value at the right time? Are you having some fun with this, by understanding the power of building an integrated brand? For years, Orange Element has been working with clients to gain a firsthand understanding of how their marketing operation functions, and how their silos are built. We can’t truly break silos down (believe me, we’ve tried). One comes down… a new one pops up. But we can connect them and help companies enjoy the benefits of working collectively to engage their customers. If you don’t know how to answer the questions above, hopefully reading on will give you a few ideas to connect the dots. Internally, centralized management allows greater opportunity to ensure each channel is performing at its highest level. Has your company considered assembling a core brand team that exists to ensure consistency, clarity and effectiveness across the board? In addition to the benefits of consistency and clarity, multi-channel management (of strategies) allows for identifying trends available to consumer behavior(s), and when to target micro-audiences in an appropriate way. The “customer journey” is a hot topic right now and rightly so—we believe effective consumer engagement requires delivering a genuine message, at the right time, in the right context. If consumers are receiving a jumbled or confusing sequence of messaging, they are less likely to understand or trust your company. As a side note, Edelman’s trust barometer for the past two years, suggests we will continue to face challenges in gaining consumer loyalty. But centralizing management of a brand can be difficult. A CMO role is typically not enough. Has your company considered assembling a core brand team? A team that exists to ensure consistency, clarity and effectiveness will stay true across the board? There might be an opportunity to create (or assign someone) to the role of a tactical director, who is responsible for overseeing development and deployment of your campaigns. Consider then assigning a lead person (from each silo) to meet with the new brand director on a regular basis. Because it is also difficult for all strategies to align, the benefits of this role can be realized by building a dashboard of channel activities, maintaining and noting both successes and failures, building pilot campaigns in support of your learnings, etc. The more centralized the strategy, the better we can present each offer at the appropriate time. For example, digital channels are showing better results, when display, native, and social all follow an orchestrated, scheduled cadence of delivery so opportunities and benefits that are not redundant or overwhelming. After all, no one likes to feel like they are being stalked. Centralizing this effort allows for longer-term adjustments to strategy to keep a pulse on what’s working best and what should be adjusted. Ethical—Responsible behavior of the brand in society, employment, citizenship, advertising, etc. As part of your newly created brand dashboard, you can use each function to help develop performance indicators and ensure you are presenting a genuine experience through your campaigns.